This play was a speed option. What that means is as soon as the QB gets the ball, him and the running back just take off. 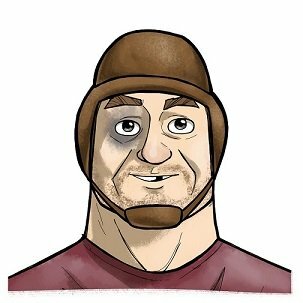 There isn’t any counteraction, no fake to the fullback or any reversing out etc. 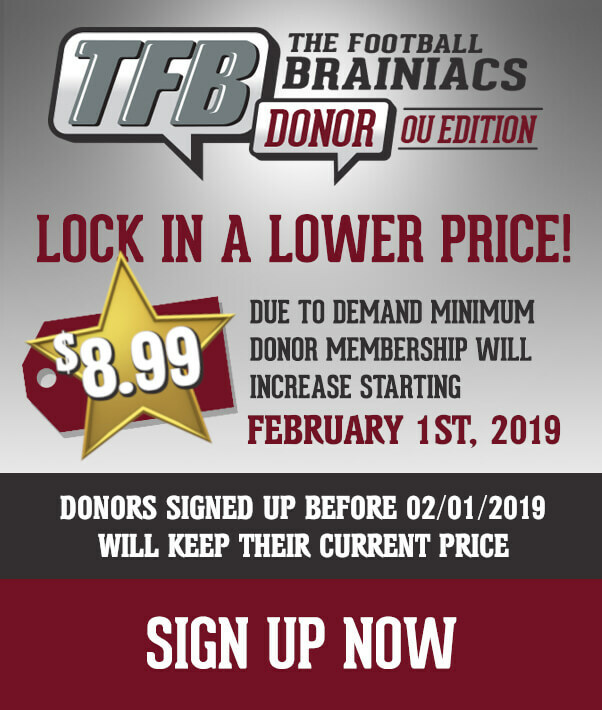 You’ve heard me say it a hundred times that running the ball is about outnumbering people. Look at the blue line sticking out of Alvarez’s head. To the right of him, we count four defenders and counting Alvarez only three blockers. 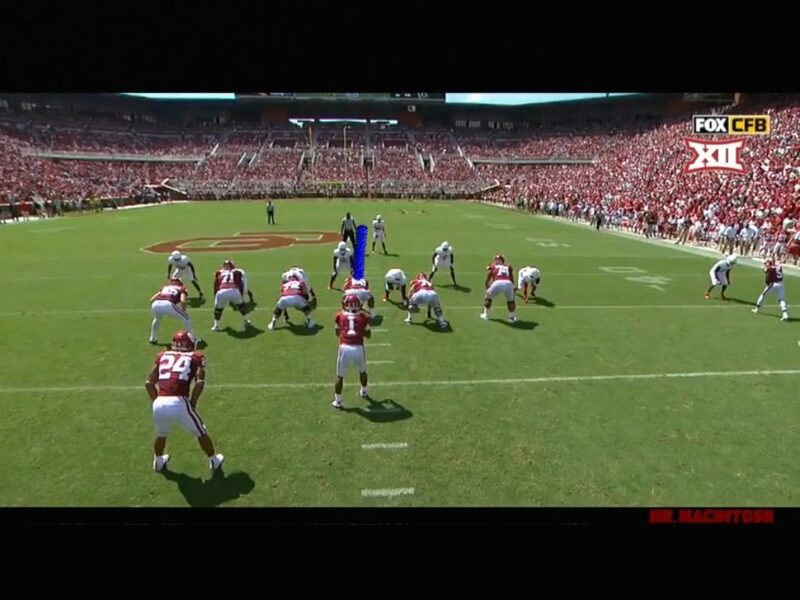 To his left, counting him there are four defenders and four blockers. So basic math shows us if we’re running, the left is the better direction to go. 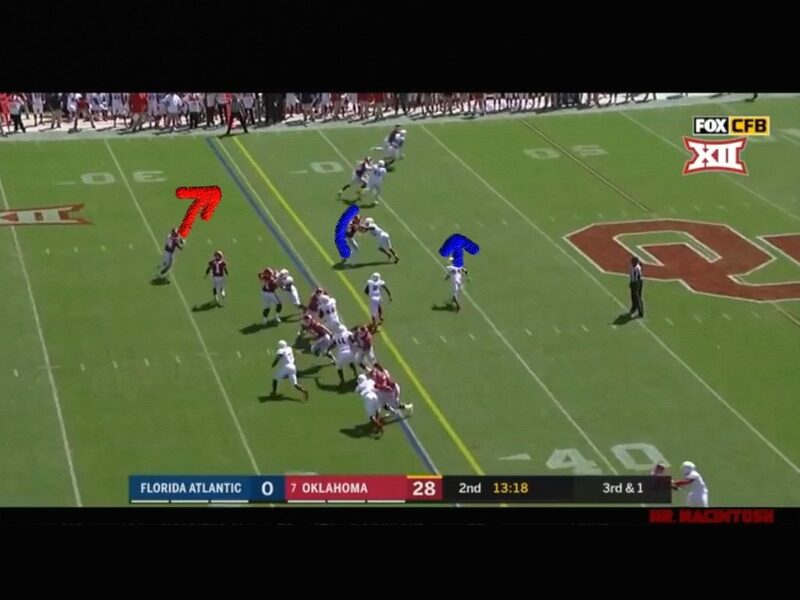 Right after the snap & people move, you can see also that Oklahoma caught FAU in a slant. Now we see six defenders to the right of the hash and only two to the left. 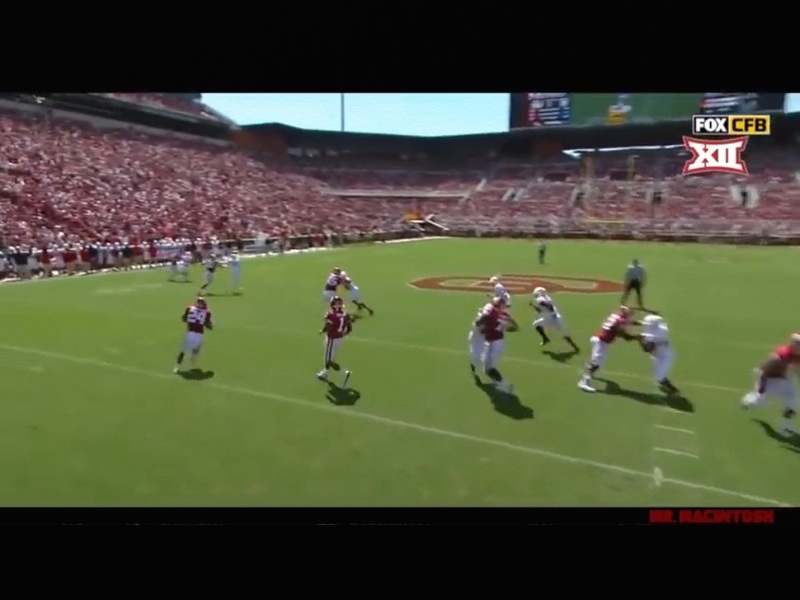 The key block on this play was Carson Meier who’s just to the bottom of the big OU emblem. You’ve also heard me say time and time again, that getting your back one on one with the safety is where you want to be. You can see Carson’s block again, and he’s running his guy on a 45-degree angle from the line of scrimmage. 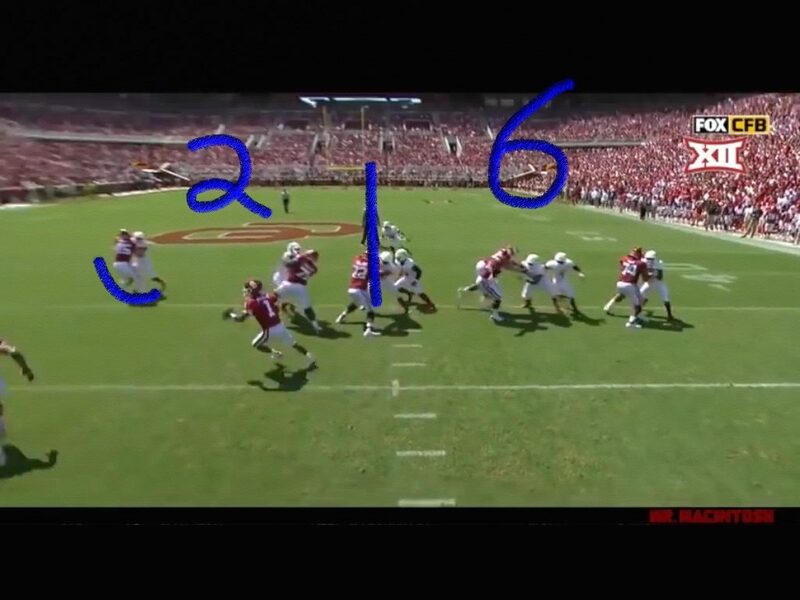 The blue line was where he started, and he’s got him 4 yards downfield. Textbook great block. Because the defense was in a slant to the offenses right, that means the DB’s are in man coverage backside. This was the perfect situation to call this play. Now you can see how much room Rodney Anderson has to operate, and why Kyler pitched it so soon. 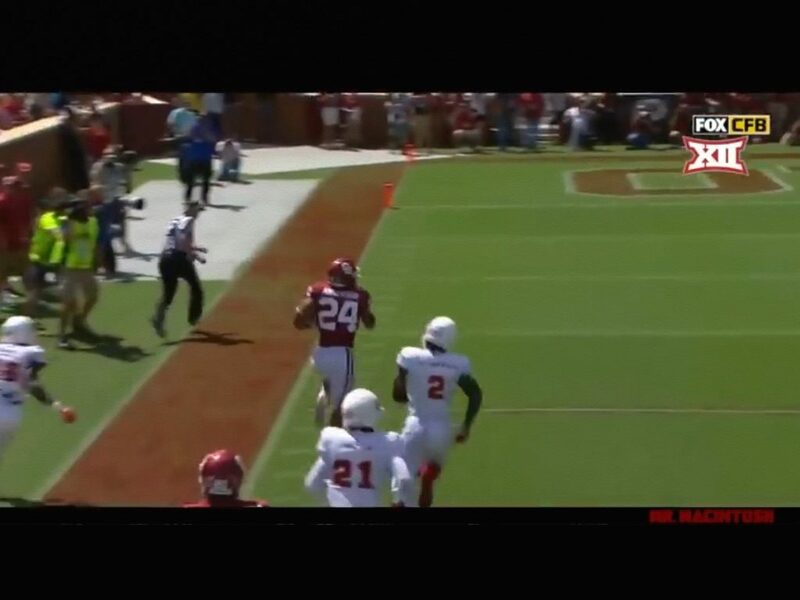 You can also see the safety’s head in the middle of the big OU emblem. Rodney’s in a race to the sideline or at least to get behind Carson’s block. And this is the end result. Rodney is deceptively fast, with some wiggle and great vision. Just a great play design and great call at the right time.